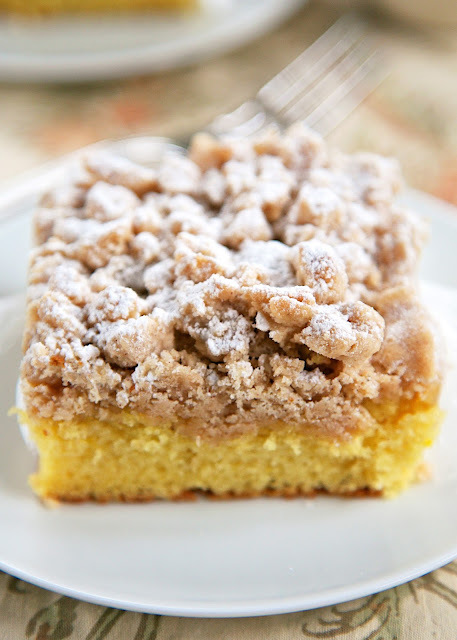 Shortcut New York Crumb Cake - yellow cake mix topped with an easy homemade crumb topping. Yellow cake mix, sugar, brown sugar, cinnamon, butter and cake flour. Super easy to make and tastes great. This cake is OUTRAGEOUSLY good! I could not stop eating it! Great for a crowd. We ate this for breakfast and dessert. 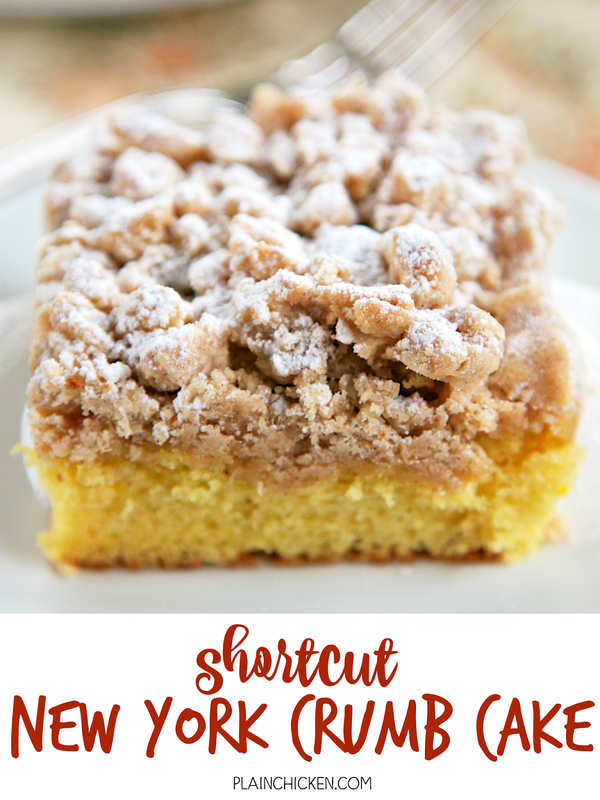 I am not a big fan of sweets, but I could not stop eating this Shortcut New York Crumb Cake. OMG! It was SO good. I couldn't walk past it without stopping to sneak a bite. This cake is great for breakfast or dessert. Really anytime of the day is just fine to have a piece of this cake! 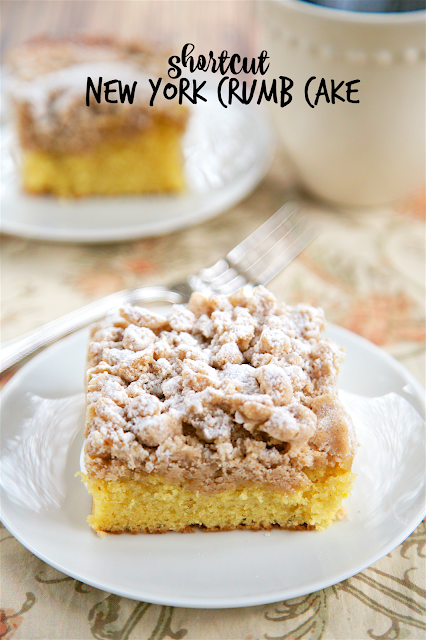 This recipe is called Shortcut New York Crumb Cake because I used a boxed cake mix for the cake. The cake batter is topped with a quick cinnamon crumb topping. SO easy and SOOOO delicious! The cake will keep for several days. I don't know exactly how many because it didn't last long at our house! LOL! Prepare cake mix according to package directions and add vanilla. Pour into lightly greased and floured 9x13-inch pan. In the bowl of an electric mixer, combine granulated sugar, brown sugar, salt, cinnamon, butter and cake flour. Mix until combined and crumbly. Sprinkle crumb mixture over cake, covering completely. This reminds me of my mom's coffee cake. All my nieces have contacted me for the recipe. This is a little easier and has the same delicious crumb topping. Thanks for sharing. I try to make something every Sunday evening for my hubby to take to work to have with a cup of tea in the morning. I usually make a pound cake of some kind or shortbreads, but this looks like a perfect thing to put in the rotation! He's a huge pecan fan. Do you think maybe 3/4 cup or so, chopped small and thrown into the crumble would work ok? You can make your own cake flour - Measure out the flour - for every 1 cup of flour remove 2 Tbsp of flour. Now add 2 Tbsp of Cornstarch for every 1 cup of flour. Sift 5-6 times and it's ready-to-use cake flour. SO measure 3-1/2 cups flour, remove 7 tablespoons of flour, add 7 tablespoons of corn starch and sift a few times. Hi Steph, it seems like the crumb topping would sink to the bottom. Is there a secret to keep it from doing so? No secret. It doesn't sink. Just place it on top of the cake and bake it. Turns out just like the picture. Enjoy! Would Bicquick work for the cake flour? They aren't the same thing, so I don't think Bisquick would work in this recipe.